I haven’t figured out exactly where Donna was before she played at the Palace Theater in Hamilton, Ohio, on March 22nd to March 25th, 1925. We know that in February she played in Kokomo, Indiana, however, I have a lot more research to do to fill in the gaps. It is interesting to note that Betty Bryant isn’t in the list of Miss Americas. The first Miss America was Margaret Gorman who won in 1921. Her title was “The Most Beautiful Bathing Girl in America.” It wasn’t until the following year, when she defended her title, that the title “Miss America” was used. So, Betty Bryant must have been a contestant either before 1921 or in another pageant. Miss Darling selected several accomplished motion picture bathers to accompany her on her brief tour of the Eastern states. Tiny Anita Walker sings as well as she wears a stunning black and white satin bathing suit. Todd Watson and Clarice Allyn, as gypsy dancers, entertain with a difficult and spectacular number, which is followed by an aerobatic novelty by the talented movie star, Gerry Gene. Al Ross, one of the life-guards, is an eccentric dancer who also appears with Alyce Louyse in the comedy number, “1000 Bathers.” Alice Lenyse is at her best in the Hawaiian dance. Mildred O’Bryan as a beach flirt does a nifty song and dance. This revue displays the different styles of bathing suits from mother’s day, in which Miss Darling appears in an elaborate silver and orchid gown—a comedy number of 1900—on to the present day bather, when Betty Bryant, late of the Ziegfeld Follies, appears in a scarlet bathing suit as “Miss America of today.” Miss Darling as the “Globe-trotter” presents bathers of various beaches of other nations as well as the fashionable bathing centers of our own country. These include the Chinese, Spanish, Egyptian, Hawaiian, and Palm Beach bathers. In addition to this unusual attraction a picture of rare merit—“Forty Winks” – Featuring Viola Dana, Raymond Griffith and Theodore Roberts, will be offered as the feature film. And the regular run of short subjects will also be offered. Owing to the enormous cost of this big double bill, the Palace Management finds it necessary to slightly increase the price of admission, but it is said that this presentation will well be worth the increase in price. Newspapers articles and advertising also ran on the 24th and 25th in all three papers, Hamilton Evening Journal, the Hamilton Daily News, and the Journal News. They performed 13 shows in 4 days and headed on to their next stop, Rushville, Indiana, performing the next day. The Palace Theatre was built in 1919 with the exclusive intent of showing movies. It was an opulently appointed silent movie theater. 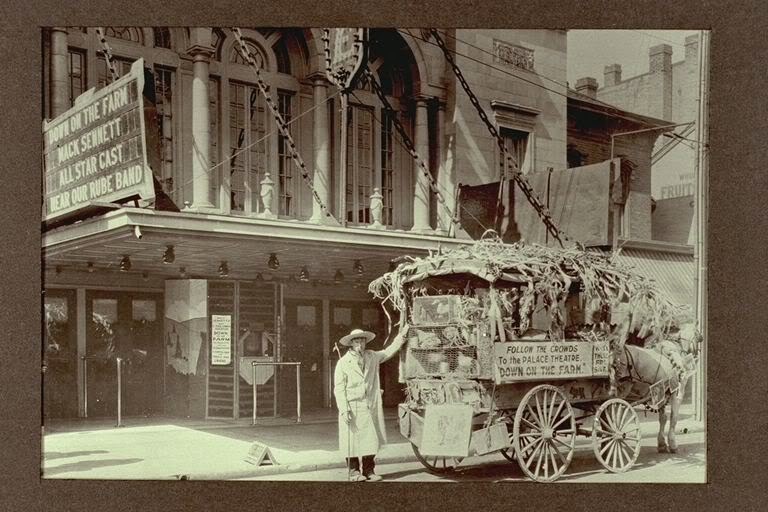 A newspaper of the time said that the $100,000 facility was “a replica of the famous Rivoli Theater in New York City.” The theater was designed by the managing director of the theater, Fred S. Meyer, and a renowned Hamilton architect, Frederick G. Mueller. Hamilton Civic Theatre (CHCT) purchased the building and restored the original, rather striking, 1919 facade. 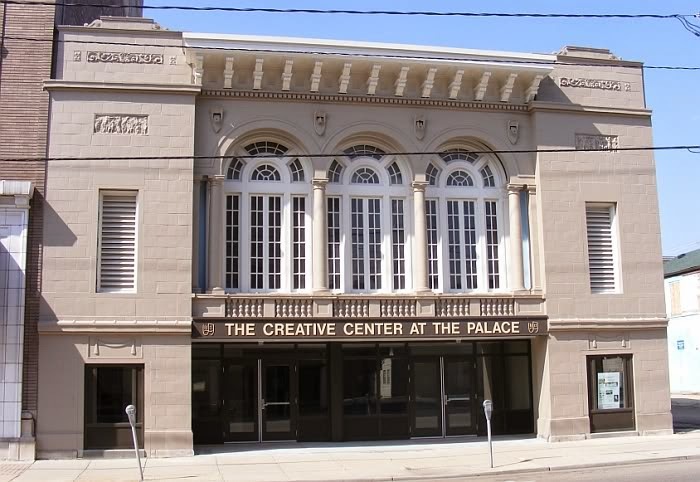 Today, the Palace Theatre is used for GHCT theatrical support need. * Source info for the 1920 photo of the Palace Theater indicates that the photo is from 1928, however, the billboard movie “Down on the Farm” was released in 1920 and is unlikely playing at the Palace in 1928. Source: Heritage Microfilm, Inc. and Newspaperarchive.com. Girls Will Appear in Person at the Palace.” Source: Heritage Microfilm, Inc.
1925 · Page 27 – “Bathing Girls At the Palace.” Source: Newspapers.com. Next Next post: 100 Years ago – The Howells of North Carolina.